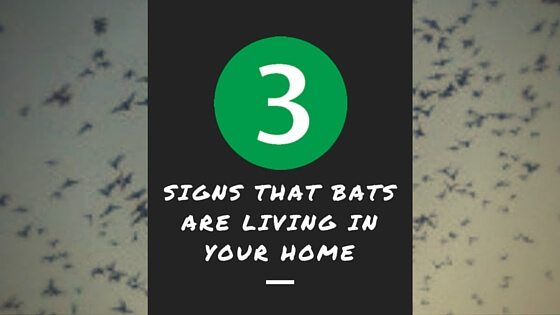 Think Bats Are Living in Your Home? I meet people all the time who are spooked by a bat that’s stuck in the house…the basement or a back bedroom. Finding a bat in any room of your house is not fun. But, this is actually very common. Bat colonies tend to roost in places that are up high like an attic. But, occasionally a bat will follow a wall cavity or pipe looking for space to sleep as well. Bats tend to be very quiet mammals. They are nocturnal but leave their roost at night to feed. You will probably only hear bats if they are living in your walls and they get disturbed by a slamming door or some other loud noise. Bats make small squeaking noises and you may hear them crawling (sounds like scratching) at dusk and dawn when they are waking or returning to the roost.I met with a family in Colorado who had 600 bats living in their kitchen walls. The only time they could hear the bats was when the refrigerator door slammed or someone pounded on the wall to wake them up. So as you can tell, they are much quieter than one would assume. Bats are creatures of habit. They roost together in the the same place year after year. And one other thing you can count on is that bats will leave guano droppings on the entrance to their roost area every night. These droppings may accumulate on a wall, windowsill, or porch, or other place directly below the place where the bats are entering your home.Guano resembles mouse droppings only larger. Inspect your attic windows for visible droppings and be on the look out for any obvious openings in the exterior where bats are getting in and out. It will probably be up high, but if the bat colony is large, it’ll be hard to miss the guano. It’s Time for a Bat Watch! If you notice any of these three things, it’s time for a bat watch. At sunset, take a lawn chair outside, sit down, and look up at your house. Just sit back and watch for bats leaving their roost for the night. If you do have bats in your house that’s one way you may see them. Once you spot the bats, it’s time to call a bat removal expert! Get Bats Out takes emergency calls nationwide so feel free to visit our website or give us a call!